At the end of March, McMaster University happened to host, on successive days in separate events, two speakers presenting talks on experiences of settlement by people recently displaced by conflict or forced expulsion. The first talk, by Elizabeth Dunn, was entitled “Displaced people, humanitarian aid and the secret lives of corpses,” and was hosted by the Department of Anthropology. The second talk, by Keith Watenpaugh, was entitled “Refugees, human rights and the Syrian War” and was part of the Hannah History of Medicine and Medical Humanities Speaker Series. Both of these separate but interrelated talks dispiritingly reinforced the growing reality that displacement is fast becoming the new normal. While Syria presents what Watenpaugh rightly characterises as the defining humanitarian crisis of this generation, the refugee crisis created by the protracted violence in that country is but a small part of the massive forced displacement of people around the globe. Recent figures released by the UN put the numbers of forcible relocated people to 65 million, twenty million of whom are officially classified as refugees (UNHRC). This is a three-fold increase in just twenty years (Dunn). Both talks made the case, in their own ways, that in this world of flux, uprootedness, and displacement, Hannah Arendt’s claims made in 1949 of the need to agree on and protect the fundamental human right to have right—as a member of a community with associated rights to political participation in that community—has more relevance today than at any other point in history. Dunn’s theoretically rich anthropological presentation about life in a UNHCR settlement in Georgia (in the Caucasus region of Eurasia) addressed the human right of permanence. 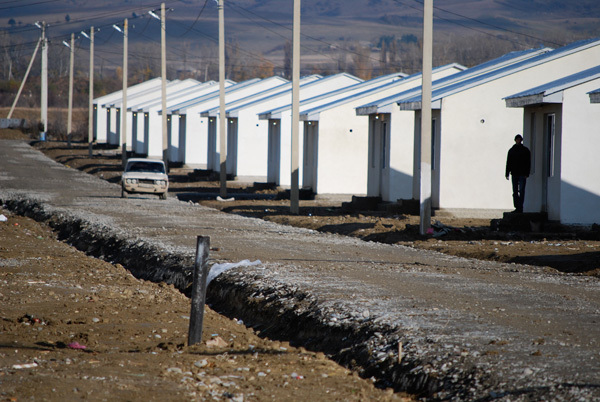 In this case, she focused on twenty-eight thousand Georgians displaced in a recent 2008 war with Russia that forced them to move into hastily constructed “permanent” housing built by the Georgian government (with UNHCR and other donor support) in a ludicrously short four-month timespan. The swiftness of the construction can be seen in poor construction quality and in the homogeneity of the dull white box houses. These structures are consistent with the practices of industrialized humanitarianism, a humanitarianism that is operating well within a capitalist system of commodified aid products and commercialized benevolence practice. No attention was given to cultural norms, kinship ties, or even giving basic nods to human variability. But the talk was not about housing, it was about a corpse and the way in which attending to its proper burial was a local act of integrating into the new settlement. Dunn described the way in which the burial of this settler’s body became a way of metaphorically folding over the topography of their former village with that of the unconsecrated ground in the new humanitarian space. By taking the risk of crossing over the militarized zone between the new settlement and the former community and gather soil from the old cemetery and water from the village well to be buried with the corpse, the displaced settlers created a topolgangers— “two very different and distinct places on the identical terrain”—of their former community (Dunn 2017). Dunn’s overarching point was about drawing attention to a lacuna in humanitarian action around refugee camps and especially settlements where people are not expected to be able to return to their former homes. There is a need for aid agencies (and I would add, host communities, to their benefit) to facilitate not only integration with host communities, but to facilitate placemaking: the transformation of a place of insignificance into “home”. Moving from the realm of the dead to that of the living, Watenpaugh’s talk turned to books and classrooms as he looked to the right to permanence not so much in terms of settling in one place, but in terms of access to a global community of post-secondary education. He began his presentation by dispelling the myth that refugee camps were filled with uneducated (certainly not university educated) people. Syrian refugees have been, since the early days of their emergence from the conflict, constituted in part by university and college students, among them some who were just a few credits away from graduation. Students had to suspend their education or postpone starting it because of the disruption and violence caused by the war. Many students had sought to continue their education in refugee-hosting countries only to be met with barriers. Barriers including financial, language or official document requirements prevented access to any but the more financially well-off or higher performing students who could access scholarships. Many of these barriers seemed to appear almost overnight with the influx of refugees, but they were defended by local education officials on the grounds of protecting the quality of the education. Effectively, it also further restricted access by the student refugees, and their families (if they travelled with them), to any semblance of stable community, political or otherwise. And as the years dragged on further separating students from classrooms, so too did refugee students’ drive to pursue it; everyday survival necessities eventually taking precedence. Watenpaugh’s discussion of Syrian refugee students seeking access to classrooms and textbooks resonated with what Dunn read in the event of the proper burial in Georgia. Each of these talks was about access to some sort of normalcy and permanence. Each case presented nodal points of access to participation by displaced persons in political communities. It is this point that is likely anxiety provoking for host communities, because integration into a community also opens the possibility for disruptions in the form of new claims political involvement. On a cynical front (something one of Watenpaugh’s informants brought up in relation to Syrian students), not integrating newcomers into dominant society risks them becoming targets for recruitment into radical groups such as ISIS who present another version of “normalcy.” On more humanitarian grounds, access to community provides routine and regularity that is part of “placemaking”, whether that “place” is a transitory, global academic community or a new (and hopefully not culturally sterile for long) housing settlement. It reduces anxieties of living in and fleeing conflict, of uncertainty caused by life altering disruptions. In many cases these unintended settlers of the twenty-first century are being met with similar (though in many cases harsher) resistance than what historical settlers encountered when encroaching on the territory of local inhabitants in the past. But unlike today’s forced settlers, those of old had a political community (the “Old Country”) to turn to for recourse. And not all those forcibly displaced today are keen on settling anywhere but the homes they left behind, so in effect they would not want to be considered ‘settlers’ at all. In the absence of being able to do return home, burials and books are just two of the multitude of ways to make people forcibly displaced feel at home (with all the attendant rights to access participation in the political community). For the Humanitarian Health Ethics Research Group, these examples speak to the ways in which healthcare and palliative care practices that build-in continuities of care by embedding customs and traditions around comfort and end of life care in locations of forced displacement (e.g., refugee camps, new settlements) can be a source of maintaining ties to former communities while also turning the new residence, regardless its state of permanence or flux, into a place of comfort. Dunn, Elizabeth. (In press). Unsettled: Displacement, Aid and the Problem of Existence in Postwar Georgia.